In this July 2017 file photo, workers position their boats at a Cooke Aquaculture salmon farm near Blacks Harbour, New Brunswick, Canada. 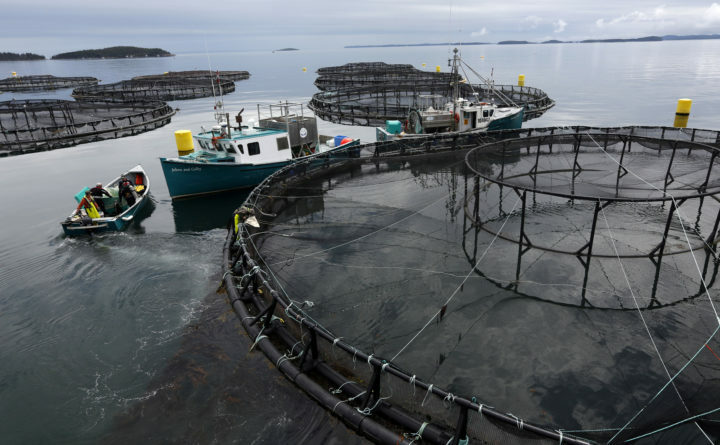 On Tuesday, rival salmon aquaculture firm Northern Harvest admitted in a New Brunswick courtroom to having illegally used pesticide last summer to treat a sea lice outbreak at salmon pens off Campobello Island, which abuts the Maine border. According to a CBC report, Northern Harvest Sea Farms admitted Tuesday to knowingly using the pesticide Salmosan 50 WP, without getting prior approval from the province, in an attempt to combat a sea lice outbreak at a salmon farm off Head Harbour on Campobello Island. Campobello Island is connected to the Maine town of Lubec via the Roosevelt International Bridge. Sea lice are small, parasitic crustaceans that attach themselves to fish, weakening them and exposing them to infection and disease. Farmed fish, which are kept penned in high densities, are particularly vulnerable to sea lice outbreaks. Northern Harvest had applied for approval from provincial officials to treat the penned salmon with the pesticide but had not been granted permission when it went ahead and used it off Campobello in July 2017, the CBC reported. The province fined the firm $12,000 in Canadian currency for using the pesticide, which is not known to have killed anything other than the targeted sea lice. Northern Harvest is in the process of being acquired by Oslo, Norway-based Marine Harvest, which also owns Ducktrap River, a smoked seafood company in Belfast. According to Ola Helga Hjetland, communications manager for the Norwegian firm, the companies still are waiting on governmental approval before the acquisition can be completed. The CBC has described Marine Harvest as “the world’s biggest player in the salmon aquaculture business” with 12,700 employees in 18 countries. In 2013, Cooke Aquaculture was fined $500,000 in Canadian currency for using a pesticide called cypermethrin, which also is fatal to lobsters, to kill sea lice at salmon farms off Deer Island and Grand Manan Island, both of which are located a few miles from Maine. Those illegal treatments, which occurred in 2009, resulted in several hundred dead lobsters being found off the two New Brunswick islands. A Calais man later was sentenced to serve a year of probation and to pay a $5,000 fine for having lied to federal agents who were assisting in the Canadian investigation into the incident. The man, who owned a Calais feed and pet store, had sold cypermethrin to a regional production manager employed by Kelly Cove Salmon, a subsidiary of Cooke, prior to the lobster deaths. Cypermethrin is banned in Canada but not in Maine, where it can be used with prior permission from state officials. Cooke Aquaculture, which is based in Blacks Harbour, New Brunswick, leases and operates more than two dozen salmon aquaculture sites in Maine, all of them in Hancock and Washington counties. It also owns and operates the True North Salmon processing plant in Machiasport. Correction: An earlier version of this story incorrectly reported that the acquisition of Northern Harvest by Marine Harvest has been completed.